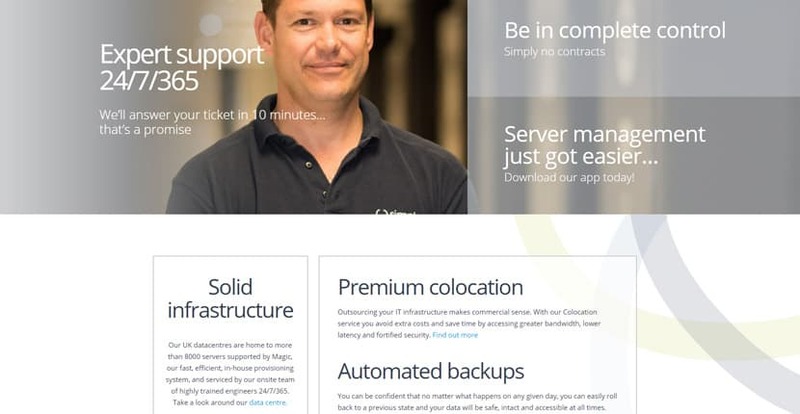 Simply Hosting & Servers Review 2019: Is Simply Hosting & Servers a Good Hosting? Simply Hosting & Servers has over 15 years of experience in the industry, with services ranging from high-quality VPS using state-of-the-art SSDs to managed dedicated server solutions with a 99.999% network SLA. As a trading name of PoundHost Internet Limited, Simply Hosting & Servers has over 15 years of experience in the hosting industry. Since their inception in 2001, they’ve specialized in high-end cloud, VPS, and dedicated server solutions housed in their state-of-the-art Tier 3+ data centers. Their main data center is located in Reading, England; however, as part of the Dada Group, they can also tap on other centers in Hong Kong, Canada, and Italy. Their SSD VPS and cloud server plans are your best bet, if you’re looking to upgrade from your shared hosting service but don’t want to pay up hefty fees for a dedicated server just yet. These are highly customizable, ranging from a simple, high-quality hosting solution to a complex, high-performance server capable of handling immense workloads. WordPress: Many premium hosting services don’t bother with WordPress. However, Simply Hosting still offers high-end cloud servers and VPS plans with WordPress (and the Plesk WordPress Toolkit) that will be great news for many customers. Colocation: With multiple facilities around the world, Simply Hosting provides server colocation services with the highest level of data protection, redundancy, and availability. Load balancing technology: This makes sure that your servers are high-availability and have better resilience and response times even during peak-traffic periods. As a premium hosting provider, it might not be as easy to operate your Simply Hosting solution compared to a standard shared hosting service. However, Simply Hosting has taken great efforts to make it very simple and easy to configure your products and have your machines provisioned. Their on-site support staff will also quickly help you settle any issues you may run into. Their Tier 3+ data center uses state-of-the-art hardware, assuring you with a 100% power guarantee and 99.999% uptime SLA for consistency and outstanding performance. Simply Hosting & Servers specializes in providing high-end dedicated and cloud server products. As such, they don’t offer any refunds, believing the quality of their products to be enough. However, they do at least offer monthly and annual billing terms for more flexibility. WordPress VPS Hosting: These cloud-based WordPress solutions come with the Plesk WordPress Toolkit, SSD storage, and upgradable bandwidth. There are two options that provide 4 or 8 GB RAM, 80 or 160 GB storage, and 5 or 10 TB monthly bandwidth. VPS SSD: These are also cloud server plans that come with your choice of the cPanel or Plesk control panel. You can come up with a custom solution or choose from four plans available, offering one to four vCPUs, 1 to 8 GB RAM, 20 to 160 GB SSD storage, and your choice of Windows 2016 or Linux as your OS with higher-tier plans. Customizable Cloud Server: If you want to be even more precise, you can customize your vCPUs, RAM, storage, and bandwidth as well as choose your OS and control panel. They’ll calculate the package rate for you immediately when you’ve adjusted each aspect of your server. Dedicated Server: You can choose from a number of different operating systems available, including Debian, Ubuntu, Fedora, and Windows Server 2016. All plans come with free setup, a 99.999% uptime SLA, a guaranteed ten-minute ticket response time, redundant infrastructure, and optional SSDs. There are six configurations offering between 2 to 8 TB storage, 4 to 64 GB of RAM, and 5 TB to unlimited bandwidth. Alternatively, you can request a custom configuration. Server Bundles: These are their Digital Agency or Web Developer plans that are tailored for users with unique requirements. I found their plans to be affordable and well within market range. They’ve even got dedicated server packages that aren’t too steeply priced, so it wouldn’t be too far of a jump if you’re upgrading to these enterprise-grade solutions. All plans come with 24/7/365 support, provided through either support tickets, email, or phone by their on-site technicians. They promise to respond to all tickets within ten minutes and to answer all calls within one minute. You can also contact them via their live chat. Their support staff are highly skilled and professional and it has never taken long to resolve any of the issues I raised. I definitely felt at ease with Simply Hosting & Servers for this reason. The performance and quality of the hosting available at Simply Hosting & Servers can’t be denied. If you’re looking for high-end dedicated and cloud hosting, there are few better companies in terms of data centers, features, and prices. Wondering how Simply Hosting & Servers stacks up against other Web Hosting companies? Enter any other Web Hosting company and we will give you a side-by-side comparison.